“In terms of new technologies and services at SKF, several new things are happening. First, our engineering team is rapidly expanding. 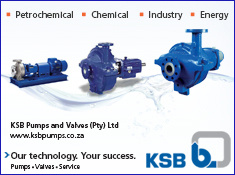 We now have 15 engineers supporting the different SKF departments, up from five just 18 months ago,” Lubbe begins. “This is part of a broader long-term strategy to get more technical skills through to the sales teams. We now operate in four areas. Applications engineers offer general technical support to the sales team to steer them towards optimal solutions for customer applications. Our project engineering team supports upgrades and new installations; and we now have a custom design team, which looks at bearing, housing and seal modifications to resolve problems. In addition, we have established a condition monitoring engineering team, which looks at supporting the implementations of systems such as our IMx Multi-Log Online systems along with our condition monitoring experts,” he informs MechChem Africa. “We have employed four young trainee engineers, who are getting up to speed and already supporting departments within SKF. They are creating excitement and keeping us on our toes. Their fresh insights have been phenomenal. I think Millennials want to do valuable work, but they do things a little differently. They are much more outcomes based and reluctant to follow procedures simply because they exist. They want to know what we are working towards and this is shifting our approach, not too drastically, but the team has become younger and we are all more enthusiastic and very comfortable working together,” says SKF’s engineering manager. The reason for the expansion? “Market demand has changed, probably as a result of the loss of skills in many workplaces in our country. Fewer skilled people taking care of equipment onsite places a lot more demand on the engineers of service providers such as SKF,” he responds. “These days, we have to take full ownership of problematic equipment, which is a big change from projects of the past,” he adds. As opposed to supplying components for rotating equipment, Lubbe says that his engineering team takes much more responsibility for understanding and improving the machines operating at customer sites. “In general, our customers require and demand much more engineering support. This is driving us to shift away from capex and resourcing, and towards contract services, aftermarket maintenance management and reliability services. “We still have customers that operate world-class maintenance programmes, but we also have those running very old and inefficient plants, for which the requirements are a little different. In the past, we have had to turn customers away because we didn’t have the capacity to support them. The expansion of our team is a response to that and it gives us engineers some exciting challenges to tackle,” Lubbe tells MechChem Africa. Citing a recent success, he says that, with Masters degree graduates in vibration analysis on the team, SKF South Africa has designed and built a fully portable IMx datalogger to support the company’s Rotating Equipment Performance (REP) offering. “These are Cloud-based units that have been built into ingress protected (IP66) cabinets so they can be safely and easily taken onsite to perform in-situ REP assessments. “These assessments give us an actual view of equipment condition, enabling us to analyse and prepare sound technical arguments before offering solutions. This is exactly the kind of support many customers need to improve the reliability and sustainability of their operations,” he suggest, adding that SKF will be trying to make REP assessments a routine part of its service offering in 2019. From a mechanical engineering point of view, Lubbe is also proud of a recent project-engineering success involving support roll bearings for a steel mill. “In response to a breakdown, we used our in-house capability to come up with a heavy duty, non-standard plummer block and sealing solution for this bearing application. We had the pattern made and the block cast in SG iron before the final unit was machined and the seals installed – all in just under 5 weeks,” he reveals. “Detailed designs of interface and sealing arrangements had to be completed here first. Then we had to rely on our sub-contractors for the manufacture – and the pattern makers were particularly helpful, working 24/7 for three days to get the mould patterns completed,” he adds. So far, these have been operating trouble-free for six-months and, while the performance targets have been met, we see this as an ideal additional opportunity for condition monitoring,” Lubbe advises. Another example led by SKF’s project engineers and its capable draftsman involved simplifying the repair procedure for an agitator at a lime quarry in the Northern Cape. “The customer has coal agitators onsite that mix coal before feeding it into the furnaces. A poor sealing arrangement was enabling fines to get into the shaft bearings, significantly reducing bearing life. “To repair the bearing, the agitator vessel has to be completely emptied before the drive shaft could be pulled off the impeller. This was a massive job,” Lubbe relates. Since the wall thickness of the shaft had to be reduced, EN19 condition T steel was used for the shaft and finite element analysis was employed to ensure the shaft could carry application stresses. “Now, instead of having to use twenty-ton jacks and wedges to get the impeller off from the top, we now connect the hydraulic lines to the self-contained piston and pull the shaft off the impeller under hydraulic pressure,” Lubbe explains. The team is also now exploring the use of Teflon coatings for plummer blocks subjected to acidic conditions and severe corrosion. “We are currently developing a prototype of an acid-proof housing that relies on our triple-barrier sealing solution. As well as a smoothed housing surface to prevent any build up of acidic slurry, all exposed surfaces are manufactured or coated with our acid resistant engineering plastics: E-ECOPUR and Teflon. In support of smaller industries and to help them monitor their equipment easily and cost effectively, SKF is using EnLight QuickCollect systems for its Smart Supplier Programme. “OuickCollect is a handheld magnetic-based vibration sensor that connects via Bluetooth to any smart mobile device. If vibration patterns outside of the normal operating envelope are picked up, the results can immediately be sent to SKF and a diagnosis can be returned within minutes,” he says. The system was developed to enable condition monitoring to be done ‘on-the-fly’ without the need to install any permanent online systems. “We are using this system very successfully at a commercial mushroom production facility, which relies on motor, gearbox and pulley drives to get compost in and mushrooms out of growing areas. “As soon as a problem is picked up, the information is shared with us and we then ensure that a bearing is delivered in time for installation, well prior to a breakdown. The programme forms part of our Smart Supplier Programme, where we use systems such as Enlight QuickCollect to predict where and when failures will occur and ensure spares are available and onsite at the time they are required. 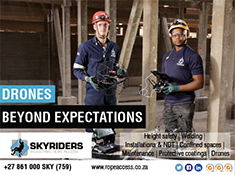 “The scope expansion of our engineering services offering is ongoing, reflecting the importance we place on lifetime services,” Lubbe says, “and our young team has the energy and the capability to tackle current problems using new technologies in exciting new ways, “ he concludes.